According to the press release, Surge of the Lucid is UK soundmeister Dissolved’s 50th release. It’s only the third to which I’ve been exposed, but my appreciation for the artist’s sounds-and-beats-in-a-blender approach has grown each time out, and Surge of the Lucid stands out, for me, as the most accessible I’ve heard while still offering an intelligent challenge to the listener. Here, Dissolved has more elegantly folded his wayward sounds into a melodic sauce instead of having them occasionally jump out the bushes at you. After the two-minute opener, “Heart of the Well,” serves as a sort of narrative opener, Dissolved brings in beats, glitch, and song-style elements. But of course it’s not straight-ahead. The wonderfully titled “Your Age in Shark Years” starts with thick, rumbling drum kicks, crunchy layers of bass and lightly overamped glitch. Vocal samples and sudden blurts of chip-set sing-song poke out of the mix. “Selmentrasm” takes a fairly textbook post-rock glitch format and warps it with curved distortions of the sound, giving it just a bit of a wobbly edge. (If you’re of the right age, think of the sound you’d get from slightly warped vinyl.) “Stickleback Red” and “Ski Run in the Distance” show off their proud chill-out heritage, with the former buoyed up on dreamy synth structures and scattered across its face with a shifting, skittering menagerie of noise. The latter sets up a short phrase as its bottom line, a simple slope that the melody gently glides down as the depth of sound ramps up. The two long tracks on this disc are worth calling out. Most of the pieces here run in the three- to five-minute range, but on “Forgotten Processes” and the closing track, “On Board The Deuterium Arc,” he stretches out to tell bigger stories. “Forgotten Processes” is downright catchy, sliding its tempo back and forth from a hurried chorus to a more plodding pace in metered moments, the whole thing haunted by vocal drop-ins and sudden stops and starts. The closer is fifteen minutes of thick and twisted glitch, snapping across the top of a drawn-out melodic line. I like the way Dissolved modulates his elements, giving more prominence to this or that as he moves the ride along. Tonal and tempo changes keep it engaging. There’ s a great stretch that’s almost entirely percussion mid-track, and Dissolved rides it perfectly down to the way he eases out of it and slides other elements back in. It must be said that there is, of course, the bit of necessary Dissolved weirdness. “Lenslock” sounds like a classical mass for pipe organ on Quaaludes, the tones turned even more ponderous and a bit unnerving. Aside from that–and even including it, really–Surge of the Lucid is a great way to get familiar with Dissolved (if you haven’t been along for the entire 50-release ride). 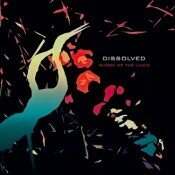 Surge of the Lucid is a great release from Dissolved. Discover this musician now. You’re already 50 discs behind.